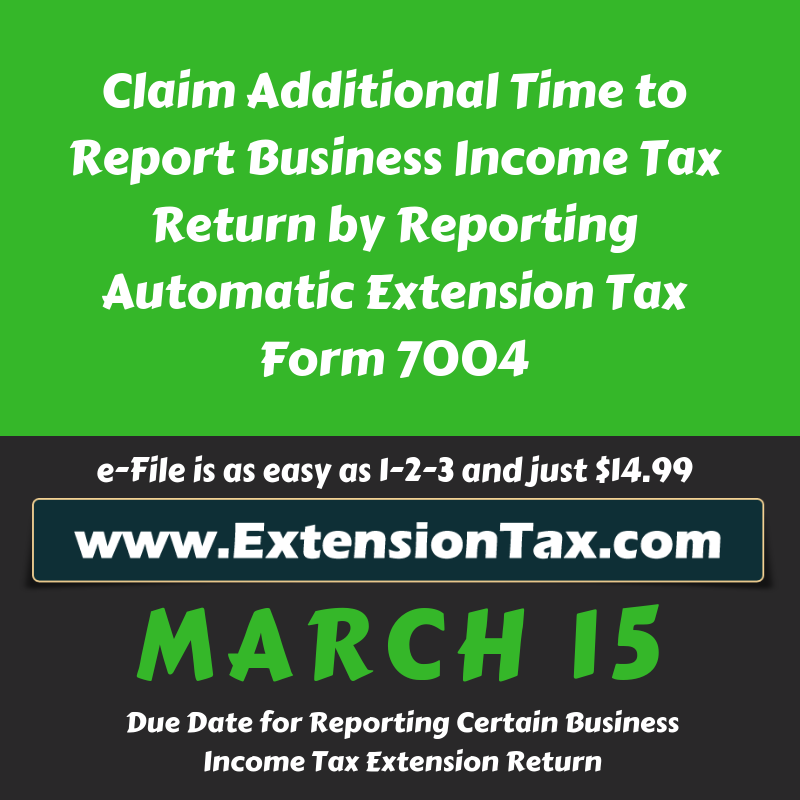 Business Income Tax Extension Form 7004 is DUE TODAY! 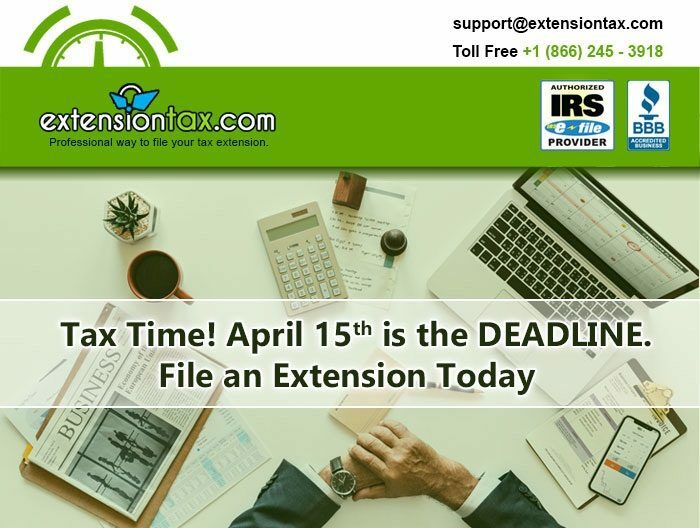 TODAY March 15th is the deadline to file your business income tax return and if you need more time to file, it’s not too late to e-file an extension with www.Extensiontax.com . Missing your tax deadline can incur hefty penalties & Interests. 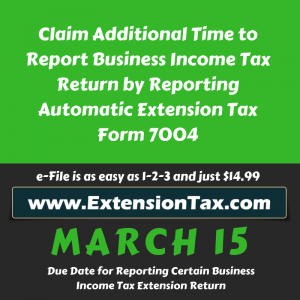 This entry was posted in Efile Extension, efiling, Extension Tax, file extension online, Form 4868, Form 7004, Form 8868, IRS Extension, IRS Updates, Tax Extension and tagged April 15, Authorized Efile Service Provider, Business Income Tax, Easy Extension, Efile 2350, Efile 4868, Efile 7004, Efile 8868, Efile Extension, Efile for an Extension, express extension, Extend your Deadline, Extension of Time, Federal Income Tax Extension, File Later, File Taxes later, Form 2350, Form 4868, Form 7004, Form 8868, Income tax Extension, IRS Extension, March 15, May 15, Online Extension, Pay Later, Personal Income tax, Six months Extension, Tax Return Preparers on March 15, 2019 by TaxExpert. 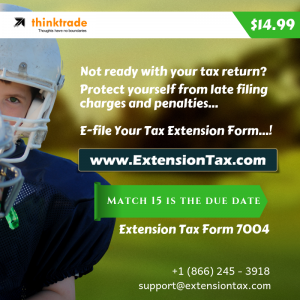 Less Than 48 Hours Remaining to E-file Extension Form 7004! This entry was posted in Efile Extension, efiling, Extension Tax, file extension online, Form 4868, Form 7004, Form 8868, IRS Extension, IRS Updates, Tax Extension and tagged April 15, Authorized Efile Service Provider, Business Income Tax, Easy Extension, Efile 2350, Efile 4868, Efile 7004, Efile 8868, Efile Extension, Efile for an Extension, express extension, Extend your Deadline, Extension of Time, Federal Income Tax Extension, File Later, File Taxes later, Form 2350, Form 4868, Form 7004, Form 8868, Income tax Extension, IRS Extension, March 15, May 15, Online Extension, Pay Later, Personal Income tax, Six months Extension, Tax Return Preparers on March 14, 2019 by TaxExpert. A C-Corp pays income tax by filing a tax return with the IRS using Form 1120 – U.S. Corporation Income Tax Return, and an S-Corp using Form 1120S – U.S. Income Tax Return for an S Corporation. 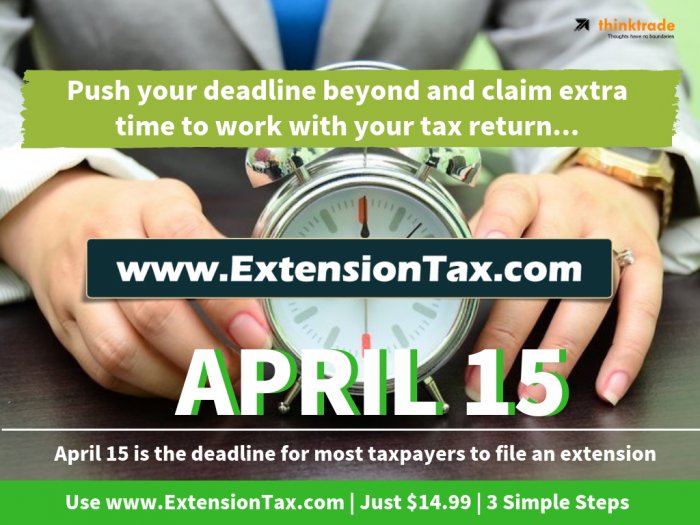 The deadline to file an extension Form 7004 for 1120 and 1120-S is 15th day of the 3rd month after the end of the tax year of the return. For example, if the close of your business tax year is December 31, 2018, your completed form must be received by the IRS by March 15, 2019. 1120 and 1120-S returns, both gives you a 6 months extension of time to file your tax returns. Meaning 1120 & 1120-S will extend your filing deadline to September 15. However, these forms may be complicated and can consume a lengthy process, with less time in hand to E-file Form 7004 for Tax Year 2018, the best way to get it done on time without facing the hazels of Interests & Penalties is by E-filing your Federal Extension Tax Form 7004 through www.Extensiontax.com an IRS Authorized E-file Service Provider for E-filing Federal Extension Tax Forms & Excise Tax Forms. 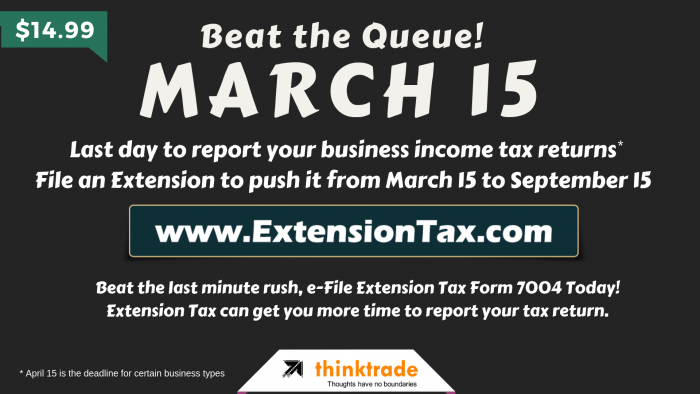 Do remember that filing an Extension only gives you more time to prepare and file your tax form. IT DOES NOT PROLONG THE TIME TO PAY YOUR TAXES. Business Income Taxes you owe has to be paid on the actual due date, which is March 15, 2019. Every minute you delay thinking about your choices, is taking you close to penalties and Interests. 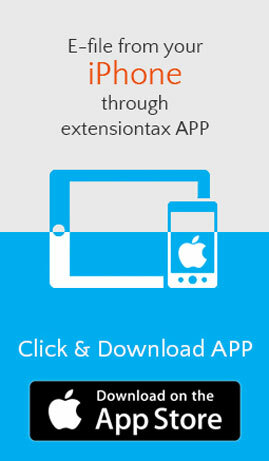 Log on to www.Extensiontax.com right away and E-file your Form 7004 now. 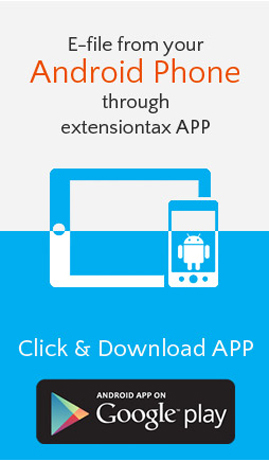 For any queries you may have feel free to reach our Tax Experts @ 1-866-245-3918 or you may even write to them @ support@extensiontax.com. This entry was posted in Efile Extension, efiling, Extension Tax, file extension online, Form 7004, IRS Extension, IRS Updates, Tax Extension and tagged Authorized Efile Service Provider, Business Income Tax, C-Corp, Easy Extension, Efile Extension, Form 1120, Form 1120 - U.S. Corporation Income Tax Return, Form 1120-s, Form 1120S - U.S. Income Tax Return for an S Corporation, Form 7004, S-Corp, Six months Extension, Tax 7004, Tax Extension, Tax Return Preparers on March 11, 2019 by TaxExpert.